Rest in Peace Brad Madvig. By Monica Augustine When your circle is microscopically small, losing one of your real friends, hits all the harder. 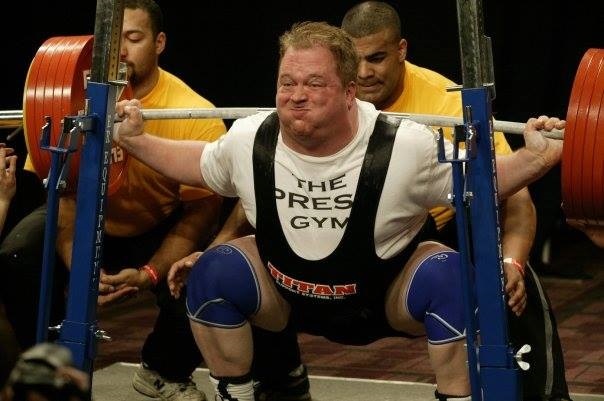 Today I learned my "Powerlifting Husband" (A term of endearment coined by his wife Amy Madvig in relief that he had someone to talk all things powerlifting to besides Jim Cahill) that Brad Madvig made his transition. Brad endured well over 100 brain surgeries in the past couple years as his condition progressed, a condition fitting of Brad, so rare that only 200 documented cases worldwide have ever existed. He's now showing off his little set of wings in his over-sized white t-shirt. Right now there are about a million thoughts going through my head "what do I say", "what do I put on the Minnesota Power Pages Page" (and I will post there later this evening), in the words of Alex Lifeson (Brad was a RUSH fan!) in a profound speech "Blah, Bluh, Bla blu Bla..." .. But really Brad was a thorn in some people's side in this sport, and at times could be a really big one, however to those who he was, there was never a question he was always looking out for the lifter and making/defending equal opportunities and access to large events for lesser known yet stronger lifting athletes in the sport. The flip of that, is he was also the first to make you laugh if you started taking yourself too seriously (which for those who knew how serious Brad took things sometimes..). To me personally, he was the first one to notice me at my first meet in Hudson without a crew or team and welcomed me into the sport and show me the ropes all the way through to competing at The Arnold. For years he kept up the database of the ranking system in our sport without pay a monumental project as this also required the programming and we appreciate the ranking system in place today much because of the work he put in during those early days so we lifters could figure out where we were, and how close we were to moving up or earning that elusive Top spot in our sport and federation. For as stressed out as he could sometimes get, my gosh he loved every thing about this sport and wanted to be involved wherever he was needed. This sport is bigger than the individual, or names, it's a family, and today, one of ours who made the social media and website aspects, much of what we really take for granted today, has passed. One thing that was a driver for Brad during all of this was his hope for the day that he would hear over the sound system... "Load the Bar for Brad Madvig!".. Godspeed my friend! So sad! prayers go out to the entire family!